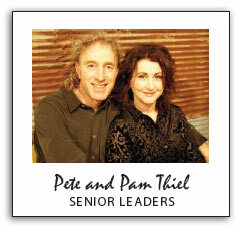 Pete and Pam are senior leaders of Firestarters Worship Center. Firestarters is a nondenominational church located downtown in the Ottertail Creamery building. Many of our members are married couples, young adults and teenagers with a passion for music and art. God is building a spiritual house and has established an altar of worship here. It is vitally important for this ministry, and it will always take first place to everything else. We are all about the manifest presence of God. We want for this to continue to be a spiritual house where the Holy Spirit is present and welcome. The community of believers is another essential part of what God is building in Ottertail. We are a prophetic community of covenant relationships where people are healed, equipped, and empowered to be the people of God. We believe that the Book of Acts shows us an awesome model for instructing believers how to interact with one another. As the community grows, we want to be an example of the early church and how it should function in our modern day society. We would love for you to come and worship God with us!